As the weather is getting chillier, are you contemplating the old ‘baby carrier versus coat dilemma’? It can be hard to keep both yourself and your baby warm in a baby carrier when the weather turns nippy. Thats why I love the Peekaru baby carrier fleece . I always get excited over revolutionary baby carriers or babywearing accessories; and when I discovered the Peekaru Original from TogetherBe, I had to get my hands on one immediately. Not only is this baby carrier cover a totally nifty, useful accessory for keeping warm, it’s also eco-friendly! The Peekaru Original is soft, very warm, and made out of approximately 85% recycled plastic bottles. The manufacturing of each Peekaru saves approximately 25 bottles from going into landfills. The Peekaru Original is a fleece vest that zips up the side. It is equipped with arm and head holes for the parent/wearer, and a head hole for baby. This product fits over any soft baby carrier, and can be worn when baby is being carried on a parent’s front or back, making it extra versatile. In colder weather, an unzipped coat may also be worn over the Peekaru. The Peekaru Original comes in several colors and a wide variety of sizes for men and women. 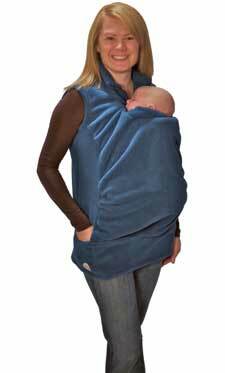 This wonderful accessory makes cold weather babywearing an easy, eco-chic endeavor that keeps both parent and passenger stylishly warm. As the weather is getting chillier, are you contemplating the old 'baby carrier versus coat dilemma'? It can be hard to keep both yourself and your baby warm in a baby carrier when the weather turns nippy. Thats why I love the Peekaru baby carrier fleece . I always get excited over revolutionary baby carriers or babywearing accessories; and when I discovered the Peekaru Original from TogetherBe, I had to get my hands on one immediately. 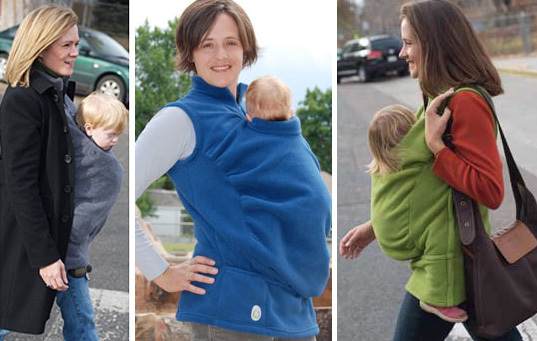 Not only is this baby carrier cover a totally nifty, useful accessory for keeping warm, it's also eco-friendly! The Peekaru Original is soft, very warm, and made out of approximately 85% recycled plastic bottles. The manufacturing of each Peekaru saves approximately 25 bottles from going into landfills.